We are definitely a My Father's World Family, but that doesn't mean we don't tweak the curriculum every year to fit our family. Everyone has their own pros and cons, so my pros may be your cons. Please comment below how you tweaked CttG to work for your family! Bible and History are VERY linked this year. You will have a thorough look into the Old Testament, and what was happening in the Ancient World during our most well known Bible Stories. This was extremely helpful, even to me as an adult. If you have done MFW 1st grade, there will feel like a lot of repeats, but it is more in depth, with world history added. Journey through the Bible adds ESSENTIAL historical context to all the Bible Stories you read this. As you read about their every day lives, it makes the people in the stores real people, instead of a character in a book. This is a book that I honestly feel like all Christian families should have. My kids still remember SO much from this book. Ancient World was very kid friendly, with easy to read info and colorful illustrations. No matter the age, it works great. Usborne never disappoints. The Jewish feasts added a depth to the OT study, using the book Celebrating Biblical Feasts. We did end up staggering these throughout the year. Many of the feasts are right the beginning of the year, and felt overwhelming. My suggestion is 1.) look ahead and be OK with spreading out your feasts; you can do the Sabbath feast anytime throughout your year (not just the week it is scheduled) 2. )Read through the whole feast before buying supplies. We did only some parts of each feast, like challah bread and ceremony during Sabbath, but not traditional Sabbath meal. TEACHER'S MANUAL- Egyptian and Greek Studies were really fun, and added historical context again to the Bible Stories we all know. The activities were usually low key, without tons of extra items to be bought, but memorable enough to help the children really experience the concept. For example, we played the Egyptian game of Senet, and it was included in the student sheets. I will mention that Egypt felt like it lasted a very long time (almost the entire first half of the school year), and like the Jews wondering int he Wilderness, I was ready to leave Egypt when it as time. That said, my kids never got sick of Egypt. And since Egypt was so deeply influential to the Ancient World, I am thankful we have a solid foundation of their place in history. Student Sheets-Complete a timeline and create a history notebook, which includes a page for each major event or person, map work, and illustrations to color. The maps alone make understanding the ancient world so much easier. The timeline is also extremely similar to if you did MFW 1st grade, but with added historical events that were happening in the Ancient World. I highly recommend doing the timeline, so you can see when historical events happen in the biblical timeline. Streams of Civilization, while a very interesting read for me as an adult, sometimes went over the kids' head. It would be great if you have a history fanatic, or older elementary/middle schooler. Take the advice in the manual, and read before hand so that you may summarize if you have anyone in 3rd grade or younger tagging along. Also it is very important to be OK with not much retention of details in SoC. If my kids could recall what happened in Ancient World, then I felt that was appropriate for their age level (they are in 4th grade). SoC add great details and context, but it is OK if they don't memorize all that. You must remember they will be learning all of this in more depth in High School, and these years are to introduce to the bigger context of History. Student Sheets- The Maps and Timeline are well worth buying the students sheets, but I was frustrated with the amount of notebook pages you have to create on your own. Look ahead and be prepared each week. There were several weeks when I was caught off guard, and would quickly have to make and print a notebook page, or we would skip it all together because I am just that Mom. Book Basket- Book Basket is usually our absolute favorite part of the MFW, but this was one of the first time I can say we barely used the book basket lists. I think this is due to the year long heavy focus on Old testament stories. There were multiple weeks where I didn't use any of the books. When we would focus more on Egypt and Greeks, I was able to get more books, but even then the list was not the most helpful. I would recommend all moms doing this study to join the Facebook Group for CttG for several free booklists! Pyramids- We REALLY enjoyed learning the science related to the pyramids using the book Pyramids. The book itself included simple to execute hands-on activities, like making a pyramid from play dough and straws. My kids still talk about how the pyramid is the strongest shape. We were just not fans of the Creation based science this year, and almost skipped it entirely. I say this not because don't believe in Creation based science, but because many of the experiments were redundant from either years past, or information my children already knew because we are a very outdoorsy family that has visited every nature Center in a 200 miles radius of our home. We are a science loving family, and met that need naturally through other avenues. 7th and 8th graders, use Apologia science instead of the above (purchase separately). We are in 5th grade, so not applicable to us. There were several hands on art projects through the year schedule in the teacher's manual. We did most of these, with success and fun had by all. We again skipped the Music appreciation lessons focus on Vivaldi, Bach, and Handel with easy-to-use CD's (in the Deluxe Package). I am sure they were good, we just never seem to fit them in. We again skipped the MFW Art, which was using God and the History of Art (in the Deluxe Package). 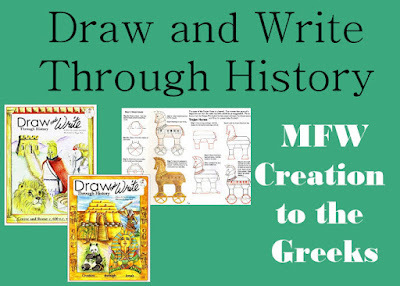 We used Draw and Write Through History for Creation to The Greeks. We enjoyed The Children's Homer, as well as fables from Aesop's Fables for Children. That said, many became bedtime stories or audio books during lunch, because they were sometimes hard to fit in during school day. Each book added great context to the Greek Study. We all LOVED Books by Patricia St. John (The Tanglewoods' Secret, Treasures of the Snow, and Star of Light) inspire children to live the Christian life (in the Deluxe Package). I highly recommend getting these, either in paper book or audio form. We have never had great luck with MFW recommend Math. We use Math U See, you can see our review here. These are based upon MFW recommendations. Foreign language is optional but highly recommended. We have not had time to really fit one in yet. Roots Words- This might have been one of my favorite parts of this year's study. Root word were simple to learn, but so important to future vocabulary skills. My kids and I love learning entomology of words we use everyday. Language lessons for Today, Grade 4- We again enjoyed LLFT, because it is a gentle Charlotte Mason approach to language arts. Some years past have felt almost too light, but I think the 4th and 5th grade are beginning to pick up, at an age appropriate level. Writing Strand- Level 3. We had some mixed feelings about this book, but overall I would recommend. At first the instructions were confusing to all of us, but once we learned the flow of the book, we got the hang of it. We personally never did "Record of Progress" page at the end of each exercise. My kids can sometimes be reluctant writers, so I wanted this to be a fun time of exploring the beginnings of writing. I do recommend following the manual's advice and doing every other week. Spelling- We have just never liked Spelling Power, it is very teacher driven and we wanted a more independent spelling curriculum that didn't require so much teacher presence. We use Spelling By Sound and Structure for Christian Schools Grade 4 . 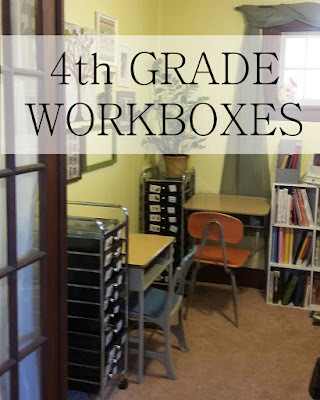 This curriculum also works very well with our workbox system. Art- Draw and Write Through History- My kids LOVE these independent art lessons, and their drawing shows it. They needed no extra instructions from me, and each week my kids were asking for more. We used Creation through Jonah, Volume 1 and Greece and Rome Volume 2 .